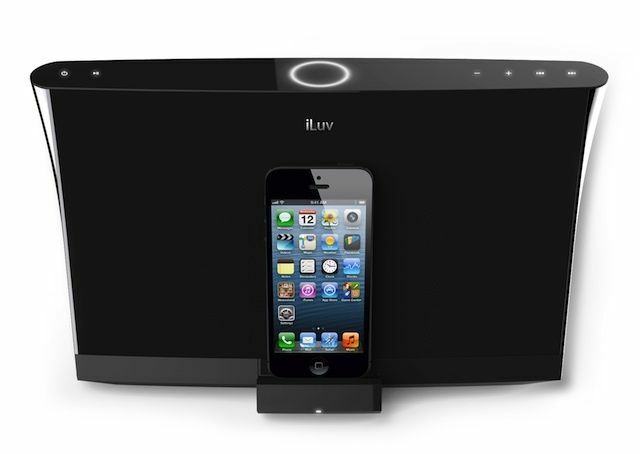 iLuv is bringing speaker docks back with the release of the Aud 5, built for charging and playback for the iPhone 5 with the swiveling lightning connector. 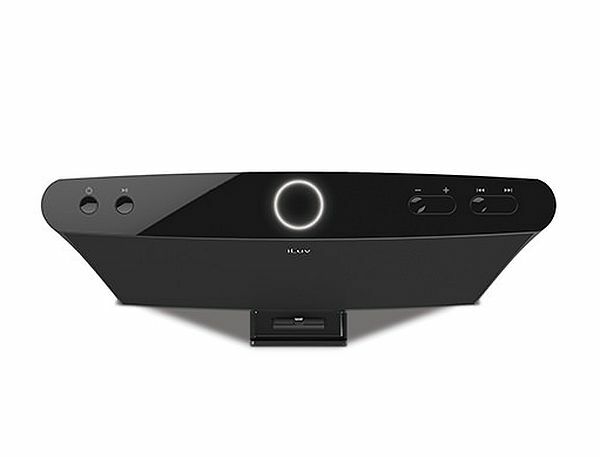 This sleek dock is meant to be a centerpoint of any room with it’s sleek look, glossy black top, and ability to charge your phone while listening. In terms of sound, the aud5 comes packing jAura sound technology that is accompanied by four active drivers and since everyone else is doing it nowaways, a passive radiator for added bass. The onboard controls consist of power, play, pause, volume, and track control. 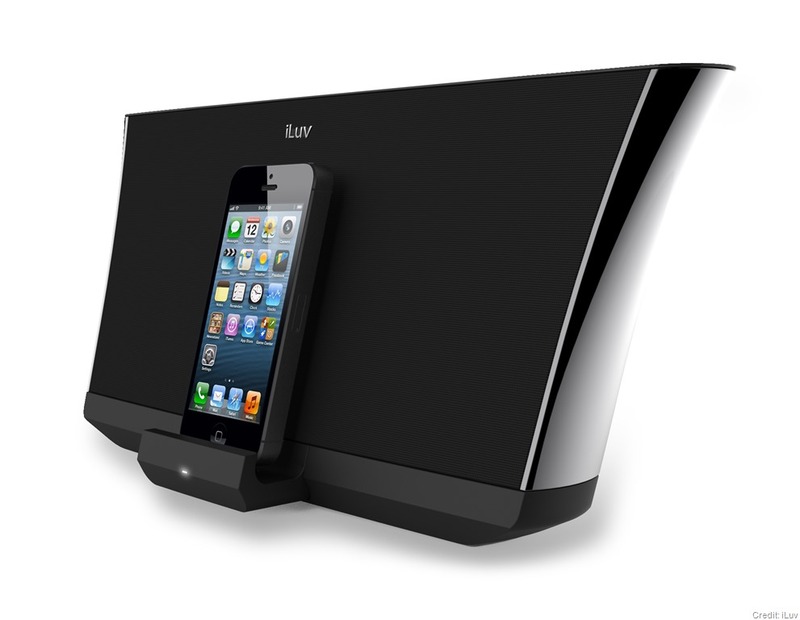 While I have reviewed a number of wireless speaker for room filling sound and just a couple docks, mostly for the iPad. This time we have a dock that doesn’t only play and charge the device, but it also has the lightning connector for the iPhone 5. 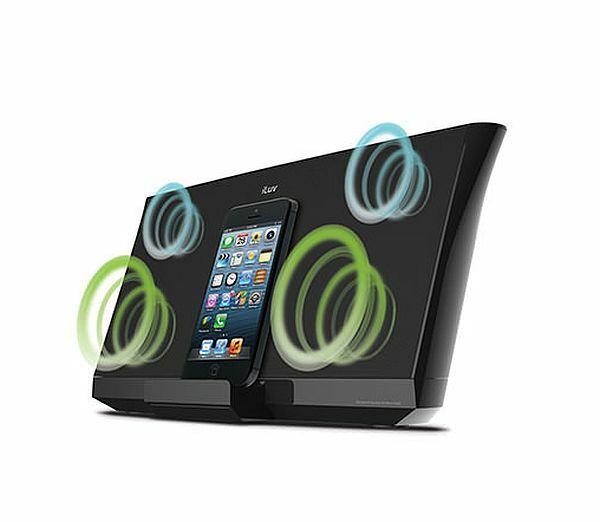 On top of having a convenient place to charge without having to get another lightning connector you get some great sounds that is both loud and full. At about sixty percent volume, it is easily loud enough to fill a room, at eighty percent you can fill a yard with sound. Whether at low or high volume, the lyrics are loud and clear without distortion and the bass is deep without being overpowering and adding a noticeable amount of depth. While it sounds nice, there are a couple items in which I felt could have been different or at least making it a little more convenient to use. I really wish that this came with a remote, so unless you don’t plan on changing the song or volume, do not go far. I also learned why there is a rubber pad where the back of my phone rested, the passive radiator is in the center, so when you are playing loud and I was listening to bass heavy music, the iPhone bounces against the aud5, like dribbling a basketball. Lastly, there isn’t only two devices that use the lightning connector, the aud5 should have supported the iPad Mini as well. In the end, I abused the hell out of this thing, I don’t know if it was the recent Duck Dynasty marathon or delusion from the 120 degree heat, but low and behold, iLuv’s aud5 took it like a champ. Hell, even when I took the Dremel to the dock so that it would now support all lightning connected devices. I was not expecting the levels of sound that came from this dock after seeing the very affordable price tag, it is pool party loud while also making a nice nightstand charger, I just wish it came with a remote so you don’t need to be so close to change tracks, pause, or crank up the jams.